One thing I miss about working in an office setting (besides the great people I worked with!) is dressing up in business casual clothing. As much as I love my casual clothes, dressing up in work wear has always been fun for me and makes me feel extra sophisticated. 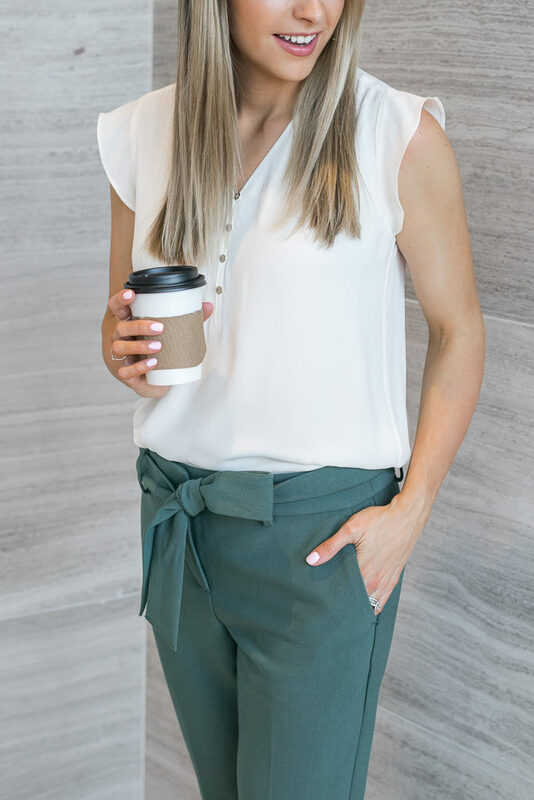 🙂 I’ve had lots of requests to share more work wear again since leaving the corporate world, so today I’m partnering with one of my favorite work wear retailers, LOFT, to share some spring inspired work wear! LOFT has always been my go-to work wear destination because of their high quality, on-trend clothing. I also love that they throw sales often, making their merchandise extra affordable! This weekend they are having an AMAZING sale for their Cyber Spring event, and offering 50% off + FREE shipping (no minimum!) with code CYBER at checkout! This is one of the best sales that they offer, so it’s definitely one to take advantage of… I know I will be! Spring always inspires me to wear more color, and it’s one of my favorite seasons for that reason. I’m a neutral girl at heart, but it’s so fun to throw more color in my closet in the spring and summer time. 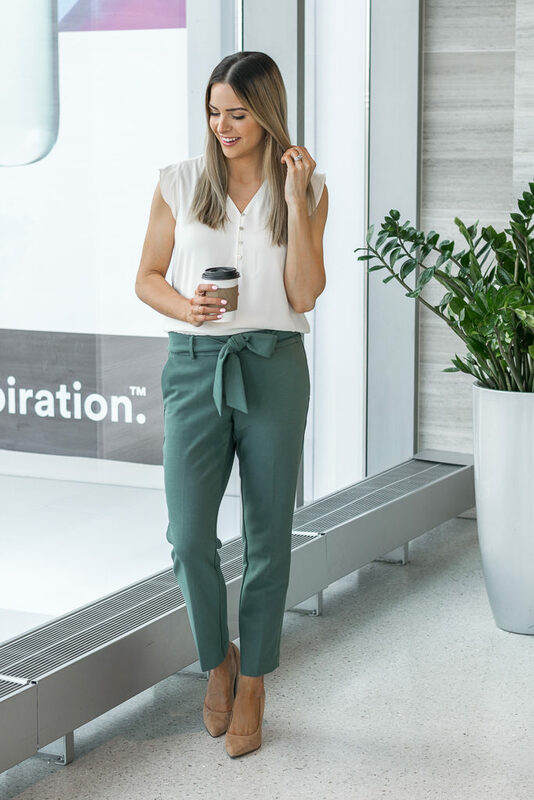 LOFT just launched some really cute new arrivals with gorgeous spring colors that are sure to brighten up your work wear wardrobe! 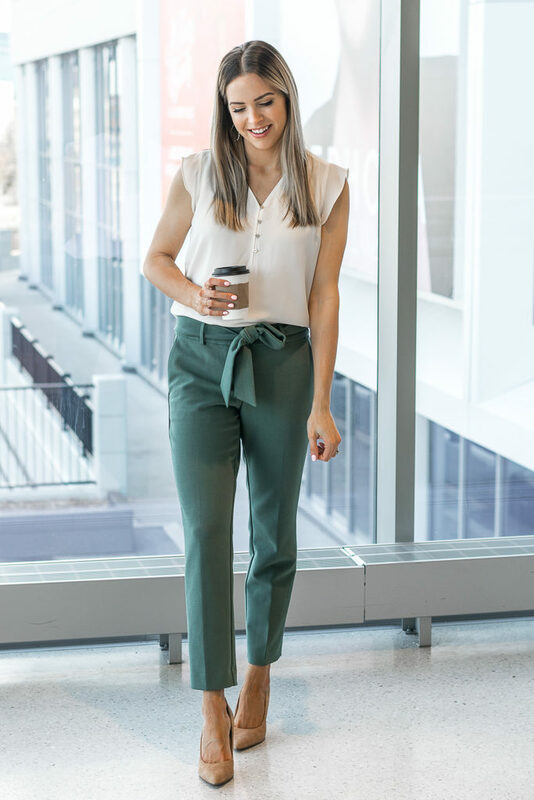 I love these green tie waist pants. The green is bold enough to make a statement, but also subtle enough to match with plenty of other colors and prints. 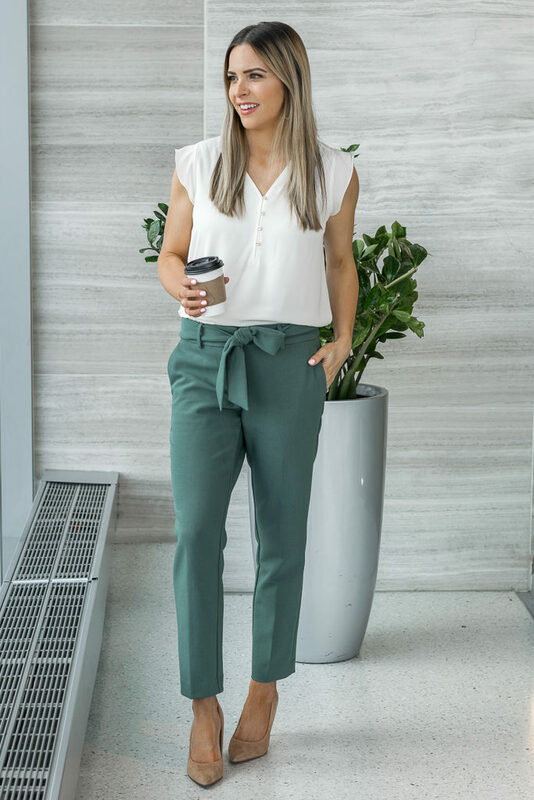 Tie waist pants are my very favorite work wear bottom, and I love that LOFT offers so many of them right now. This pair that I’m wearing run a bit large, so I recommend sizing down (pro tip: I find that I often have to size down in most of LOFT’s dress pants). 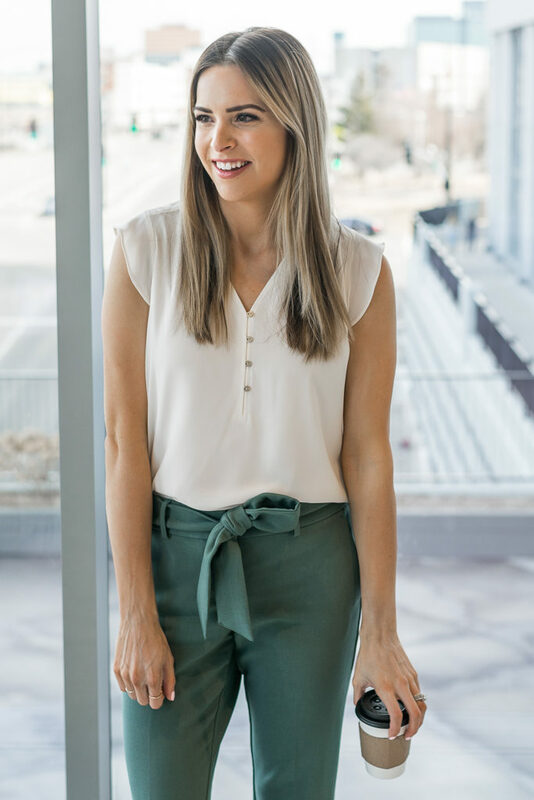 I definitely recommend stocking up on a few staple lightweight tops that wear well under cardigans for cool mornings and look great on their own for warmer afternoons. The temperatures always seem to be unpredictable this time of year, so a versatile top like this button v-neck flutter sleeve top is a great option! It comes in a few other colors and runs true to size (I’m wearing the size small for reference). If you haven’t had the chance to check out LOFT’s jewelry and accessories yet, I highly recommend you take a peek at their new spring pieces! I am wearing these beautiful gold teardrop earrings that pair perfectly with any outfit. I’m also loving these statement earrings, this gold necklace, this beaded bracelet and this leopard scarf! This post was written in collaboration with LOFT. As always, all opinions are my own. Thank you for supporting brands that support The Styled Press!